Auditory distance perception: The perception of sound source distance provides spatial information to the listener that in certain circumstances can be critical for survival, such as determining the proximity of a predator or prey, particularly in the dark or when sound sources are outside the field of view. It is surprising, therefore, that auditory distance perception has been understudied relative to directional sound localization. This gap in knowledge has motivated our work in this area. 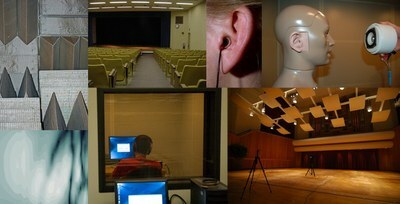 Central findings from our research include a demonstration of the independence of sound source loudness and the perception of source distance, demonstration of the importance of reflected/reverberant sound for distance perception, and the demonstration that although humans can flexibly combine information from multiple acoustic cues to distance, systematic biases in perceived distance exist. Newer work has shown that monaural distance coding in humans depends critically on both reverberation and amplitude modulation characteristics of the sound source, and that these two stimulus attributes work in concert to code distance within neurons of the rabbit inferior colliculus. Zahorik, P. & Wightman, F. L. (2001). Loudness constancy with varying sound source distance. Nature Neuroscience, 4(1), 78-83. Zahorik, P. (2002). Direct-to-reverberant energy ratio sensitivity. Journal of the Acoustical Society of America, 112(5), 2110-2117. Zahorik, P. (2002). Assessing auditory distance perception using virtual acoustics. Journal of the Acoustical Society of America, 111(4), 1832-1846. Speech understanding in acoustically reflective environments: From our work on auditory distance perception, it is clear that reverberation plays a very important role in the auditory perception of sound source distance. On the other hand, reverberation has long been known to degrade speech understanding. The degradation is most evident in high levels of reverberation and for those with hearing impairment. For individuals with normal hearing in environments with moderate levels of reverberation, however, speech understanding is surprisingly unaffected. To understand this apparent paradox, we examined the role of listening exposure to reverberant sound fields. We have found that for normally hearing listeners in moderately reverberant environments, speech understanding improves significantly with brief prior listening exposure, suggesting a form of perceptual adaptation to the reverberant sound field. The adaptation seems to be driven by the interaction of the speech amplitude envelope with the reverberant sound field, but the details of this process are, as yet, unknown. Understanding this process and the potential interaction with binaural processing will provide important guidance for design of hearing aids and assistive devices that improve speech understanding in reverberation, while maintaining known sound quality benefits of reverberation. Multisensory integration in auditory space perception: Our previous work in auditory distance perception indicates that perceived distance in humans is systematically biased: far sound source distances are underestimated, and near source distances are overestimated. This is in stark contrast to visual depth perception, where distance estimates are highly accurate. We have shown that the addition of visual depth information can dramatically improve auditory distance accuracy and also lower the variability in auditory distance judgments. Similarly, we have shown in the domain of directional sound localization that multisensory input over time can facilitate improved accuracy by reducing front/back confusion errors. These results provide important groundwork for developing methods of improving orientation and navigation abilities in humans when information from a sensory modality is missing or degraded, such as for blind navigation using sound. Zahorik, P. (2001). Estimating sound source distance with and without vision. Optometry and Vision Sciences, 78(5), 270-275. Zahorik, P., Bangayan, P., Sundareswaran, V. Tam, C., & Wang, K., (2006). Perceptual recalibration in human sound localization: Learning to resolve front-back confusions. Journal of the Acoustical Society of America,120(1), 343-359. Wolbers, T., Zahorik, P., & Giudice, N.A. (2011). Decoding the direction of auditory motion from BOLD responses in blind humans. Neuroimage, 56(2), 681-687. Virtual auditory space technology and validation: Virtual auditory space (VAS) technology enables accurate and precisely controllable simulation of listening experiences that mimic those resulting from real sound sources in real sound fields. This technology has been transformational for the study of spatial hearing. Our research has made extensive use of VAS technology and has been involved in various efforts to validate, improve, and apply the technology to new areas of study. For example, we were the first to demonstrate that highly controlled VAS methods can result in virtual sounds that are indistinguishable from real sound sources. This is the strongest form of validation for the VAS method. We were also the first to apply VAS technology to the study of auditory distance perception. More recently, we have validated the use of VAS technology for simulating the relevant physical and perceptual attributes of small room acoustics. Application of VAS technology will continue to have a major impact on the field of hearing science. Zahorik, P. (2000). Limitations in using Golay codes for head-related transfer function measurement. Journal of the Acoustical Society of America, 107(3), 1793-1796.